First, let me insert my usual disclaimer here that I’m no expert on skincare – I’m just a skincare enthusiast. I’m also by no means a guru on all things Shiseido – there are just my experiences with these products. I’ve been using skincare from this brand starting about 5 years ago. I would categorize the brand as high-end but not luxury, with the skincare above the $50 price point and mostly below $100 each. Shiseido is sold primarily through department stores and inside special beauty boutiques in some drugstores. All of the products shown are made in Japan. The line has some nice moisturizers and cleansers that I’ve repurchased – but like all brands, there are good and bad products within the range. I thought I’d provide a quick overview of some of the products that I’ve tried. I’ve categorized the items into Love, Like, and Loathe. I wrote about these items in my winter nighttime skincare routine. They’re better suited for the winter months as they’re too emollient for summertime. I’ve just recently put away the face cream for the season but I’m still using the eye cream in thin layers in the evenings. The key ingredients aren’t that remarkable (glycerin, squalane, glycol and some antioxidants) but they feel very refined and they agree with my skin. I have a difficult time finding eye creams that are hydrating enough but do not cause milia (those little flesh coloured bumps around the eye area) and this one satisfies both criteria. Neither of these products have strong scents. I used to get this one confused with The Extra Gentle Cleansing Foam from their “The Skincare” line. The Creamy version is SO much better than the Gentle one – it’s not as stripping or drying. There are little bits of hydration beads in the cream which makes the cleanser feel super silky. And this baby lathers up SO much! I only need to use a pea size amount as pictured. A tube lasts me for months. I posted a rave review about this. It was surprisingly effective – I likely won’t repurchase this but it did introduce me to retinoids for my under eye area, I’ll be looking for a cream or treatment in a less wasteful format after I finish these (I have 2 unopened cartons = 24 masks). I use this as an under eye serum – it makes the area look really smooth which is likely due to the high silicone content. It also has some vitamin C and film-firming ingredients. It’s not a miracle product but I like that it doesn’t cause milia around my eye area. The vacuum pump is fantastic in keeping this product fresh. This product has a light scent. The Ibuki range is relatively new for Shiseido – it’s supposed to help with “stressed” skin, whatever that means. This is quite inexpensive for a Shiseido moisturizer on a per ml basis. This is recommended for nighttime use but it’s very lightweight, so for me, it’s better for daytime. It performs very well under sunscreen and foundation and keeps my skin feeling supple. I really like the pump bottle, although I seem to be going through this product rather quickly due to its runny texture. It’s quite fragranced, unfortunately. I no longer have this but it’s very similar to the Ibuki one above – a very fluid milky lotion that I used as a summer time daytime moisturizer. It’s also very fragranced. However, I saw NO whitening when I used this. I don’t have this anymore – I decided to try this because it was on a list of must-have cleansing oils. This functioned ok as a cleansing oil but it is overly fragranced, and it not even a refreshing scent – it smelled like heavy old-lady perfume. It was also quite drying – it’s a heavy duty cleanser which stripped my skin. I do like that Shiseido promotes this with their sunscreen as a sunscreen remover. A lot of people complain about waterproof sunscreen breaking them out, when they’re not removing them properly. But, don’t buy this one – try the MAC Cleanse Off Oil instead, that smells like lemon meringue. Bottom line: I would say that overall, the Shiseido skincare lines are more geared toward dry and normal skin, and nothing really caters to oily or blemished-prone skin. The skincare is also quite focused on anti-aging and whitening, which are 2 key concerns in Asian skincare. Many of the products are fragranced to varying degrees, so if your skin is sensitive to fragrances, skip the brand entirely. Personally I would likely just focus on repurchasing the eye and face cream, the foaming cleanser and maybe the corrective serum for under my eyes. The rest of the items I’m sure there are other brands out there that offer better products. I’m mildly curious about Shiseido’s premium skincare line, called Future Solution LX, which my friend swears by. It is ridiculously pricey though, the face cream is $320 for 50ml! What makes it worth that price tag?! Have you tried Shiseido’s skincare? What brand of skincare would you recommend for me to try? Amazing post. You got so much from Shiseido! I associate the brand with my mom because she’s the reason I even know about it. She used their makeup, and the sales associate noticed I had acne and we bought this line for like acne prone skin or whatever and it didn’t work and probably made things worse. I completely stopped use. But I still think of them as a fancy brand. Yeah Shiseido isn’t so good for acne prone skin unfortunately! Glad to hear that Clinique is THAT effective – there’s a brand out there for everybody. I do really like their Dramatically Different Lotion – no frills no nonsense moisturizer that just works. I finished my giant pump bottle and now I’m using that Shiseido Ibuki one to use it up but I miss my Clinique! Do you recommend the dramatically different lotion? Yes, wholeheartedly! I also have a friend who is more oily skin and she loves it too. If you go during gwp time, they always include it in their gwp, maybe try it out that way first? I second that recommendation. There’s a reason why it’s a best seller! I love skincare posts and I really wanted to know the 411 on the Ibuki line since its been its sold through sephora’s website.When it comes to skincare I am more of a Caudalie /Boscia fan. I feel like plant derived products work well on my skin. However, I have to other skin product lines that I have been wanting for me to use and that it is Kielhs and Ole Henkrinsen. I like Caudalie a lot too! Not really into Boscia ever since I tried their cleansing oil and it burned my face! It has menthol in it – WHY! I think you’d like the Ibuki line – i quite like it, I just wished it wasn’t so fragranced. I’ve tried the entire range from samples and they’re all good. Oooh Kiehl’s is great! And my friends use Ole Henriksen and they really like it. Glad you liked it! 🙂 What would you be interested in trying from Shiseido? 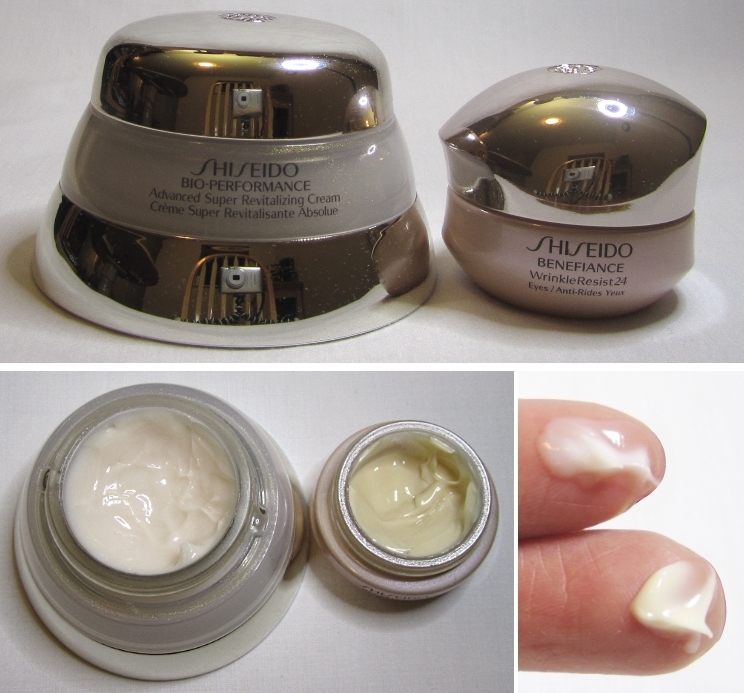 Shiseido skincare look so luxurious! I haven’t tried anything other than their lash curler. I want to try some under eye masks like those but I think something less pricey! There are some eye masks by less expensive Japanese sheet mask companies, I’m sure! Their Pureness line focuses on oil control. Looks like that would be more beneficial to anyone with combination or acne prone skin. I remember trying their cleanser and toner, but forgot how the results were (it was years ago when I tried it). Good to know! I honestly have never come across the Pureness line even though it’s on the site – the SAs have never shown me any of the products in this range! Now looking at it, I like the look of the Softener and the gel cream. Thanks! They actually have a starter kit for it at Sephora, so I may have to try it if it’s still available. I love looking at your skincare posts! I’m a bit of a skincare n00b so they’re always very informative to me. I don’t think I’ve ever tried any Shiseido skincare (might have a sample or two lying around that I never got to). That creamy cleanser sounds like my kind of thing. I’m gonna add it to my wishlist. The creamy cleanser is fantastic! Maybe you can get a sample to try before committing to a full size. 🙂 Or wait until gwp time to get other things to try too. Crap, they have a GWP now, too. No no that’s not it. That one doesn’t foam at all. It’s a cream cleanser that requires it to be tissued off, a hassle! Let me have a look-see. I decided that I need the Extra Creamy Cleansing Foam! I need anything that has hydration. It will be my best friend! This is a great post! What kind of skin do you consider yourself to have? Love this post! We love the same products, although I personally find the Extra Gentle Cleansing Foam just as good as the Extra Creamy Cleansing Foam. I am positive I received a sample size of the Ultimate Cleansing Oil that was a gwp, and I’ve been trying to find it so I can bring it for travel/see if it can replace the MAC oil, but I don’t know where I put it! Frustrating. Have you tried their Pureness line before? I’ve never used it, but from what I remember, it’s their line for oily skin. Maybe they got rid of the line, though – it still shows on their website but so does “The Skincare” line and that’s discontinued. I wish I liked the Gentle Cleansing Foam because it’s CHEAPER – ugh. Hmm I’ve not seen the Cleansing Oil in gwp – usually they give eye makeup remover or their softener as gwp. I wished I’d gotten the Cleansing Oil as gwp instead of getting the full size! Someone else mentioned to me about the Pureness line but have never tried it – at the counters they always steer me toward the Bio-Performance and Benefiance range. I do really like the Ibuki line which I feel like is geared more toward a younger demographic – have you tried that line? Maybe I’m going crazy. I could swear I saw a gwp size of it lying around in my house at some point, but now I can’t find it! I have tried a cleanser and a moisturizer from the Ibuki line. It’s not my favourite of all time but I feel like it gets the job done! Thanks! Shiseido is my favourite skincare brand – it just works for me!